Rachel Waddington (r) with associate Joe Horobin (l) collecting their award for New Business Challenge in July 2017. In July 2017, Diagonal Mentoring™ – an innovative mentoring scheme for young people aged 14-16 years – was awarded Highly Commended in the category of New Business Challenge. 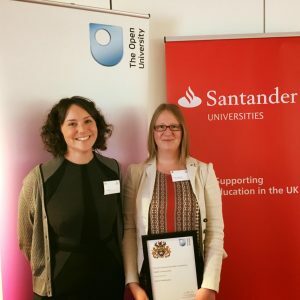 The award was among seven global Innovation Awards handed out at a ceremony in Milton Keynes by the Open University in partnership with Santander Universities. The prize-giving followed a closely fought competition among students and recent graduates from a wide range of degree subjects to innovate in business. Diagonal Mentoring™ is an award-winning, integrated programme of workshops and 121 mentoring that targets the development of young people’s inner psychological and emotional resources. Diagonal Mentoring’s unique, evidence-based approach is underpinned by recent developments in neuroscience and introduces psychological concepts and research studies to young people in order to interactively explore critical themes of identity, relationships with others and wellbeing. ‘Diagonal Mentoring’ describes the dynamic between the young person and their mentor: neither vertical (like a parent or teacher relationship) nor horizontal (like an inexpert peer relationship). The ‘diagonal’ mentor is a fully-rounded adult with relevant life experience, and expertise in both psychological and therapeutic interventions. By focusing on mentoring in conjunction with human psychology, rather than counselling, we expand the young person’s notions of ownership and self-belief to develop a stronger identity and internal resilience. Neuroscientific research tells us that post-pubescent adolescents are in a critical phase of brain development affecting areas of the brain responsible for emotional self-control, working memory, cognitive processing, concentration, and problem-solving. This age group is particularly susceptible to external pressures, not least social media, maturation and physical appearance, poverty and family breakdown, cyberbullying, self-harm, and increasing competition for post-16 education and training. Key Stage 4 is an ideal period during which to offer targeted support for the development of healthy functional behaviours. I am really excited about Diagonal Mentoring™ and the outcomes for the young people who access this unique opportunity to explore what it is to be ‘human and in the world’. Contact Rachel directly for more information.